As I have made a point of looking into the various coffee can shapes, 782, 3022, 3023, 3618, 3038 (etc), I'm interested to see how the Modello cup measures up. Height and outside diameter, and perhaps a comparative photo beside a Cook & Serve coffee can, 3038 or other from the above list would be helpful. So, is the Modello cup a completely new design or a further modification? I will try to remember to take comparison pics when I get a chance. However the Modello range was designed in 1988 and the whole range has new numbers. 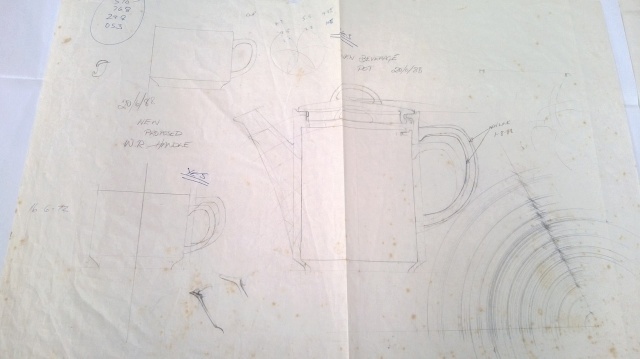 Here is a drawing of the mug and the coffee pot. There are drawings of other pieces too. How does the Modello shape compare with other cans? I thought, and can see from the picture, it had a more shapely base, but one for sale on tm doesn't give that info. I had it in mind that Modello was a from scratch design but felt the need to check it out. I've had opportunities to buy them but it has never been important enough. Despite the extra shape at the base I'm still inclined to consider it a coffee can. I have a whole set and I do see them listed as cans. The saucer well is the size of a can. I picked up a Modello duo today and see that it is completely different from the other cans mentioned above. Modello duo unnamed pattern d713. I'll take some comparative photos of this with other cans some time. How odd, as I know the name of this pattern - Candy d713 or d71300. and it is in the Classique shapes. and there is no indication that it is part of the Modello range. That catalogue has 7 different Modello patterns, but it doesn't include Candy. However your find proves that it is part of the range due to the shapes. The Modello sugar and jug are totally different to the photo sunny posted. So I'm a little confused. Well, I did look all through the patterns, and the unknowns, but totally missed it, perhaps because the gallery pic is a jug. I thought you'd know what it is. The only Modello I have and it's wrong! Happy to oblige by providing odd pairings such as this. Oh I don't think you are wrong Jeremy. It's just that I wasn't aware of Candy in the Modello range and yours is definitely Modello Candy! Just a thought... Its not Taranto cup teamed up with a candy (mug) saucer, by any chance? I can't tell the shade of grey on the attached photo.. I have noticed the Modello saucers do look like the one used with the 3051 mugs. I checked it out Janice and it all looks correct. That looks like my Taranto photo from the catalogue I have and yet it has an attribution to the Museum ....? Do they have it as well??? I often see the Café cups paired up with the Milano Modello saucer, plus a few other patterns too. It's the saucer that is Modello on Jeremy's pair and of course the cup is too and this could go with Taranto. Most unusual, but perhaps now we will see a few more! I got the duo from Arkrights in Dargaville. They were paired up and there was no other Modello in sight. The greys appear to match. The only mark on the cup is the made in New Zealand. 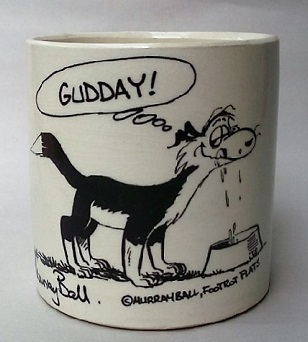 Would you expect a banded pattern on the cup rather than solid grey? By "wrong" I only meant undocumented and what has been said above: towards the end there were some strange pairings of shape and pattern. The saucer is the Modello shape, unlike anything else as far as I know. 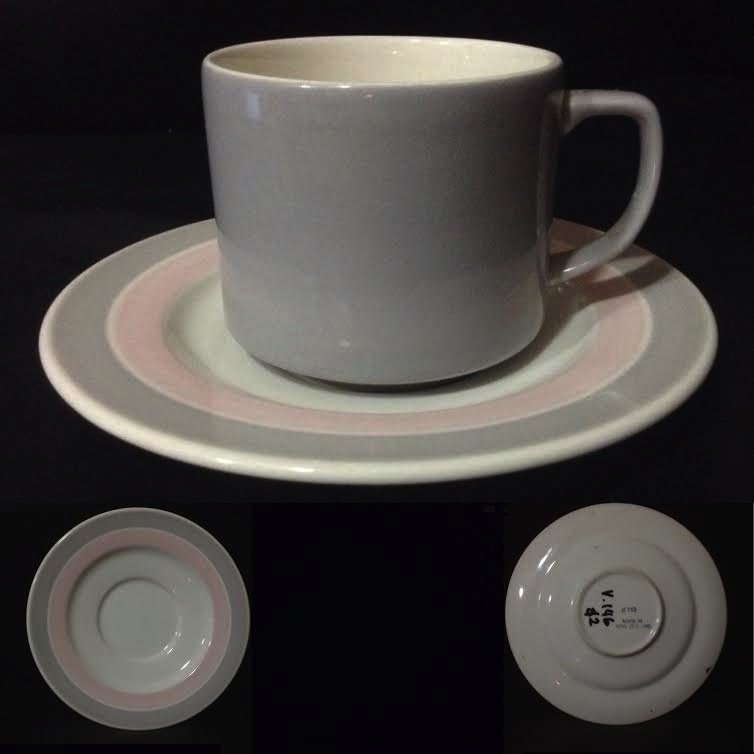 I was thinking that there is the possibility that the saucer could belong with a Candy 3050/3051 mug which would be white with a pink & Grey trim. This listing looks like Modello .. So I think Jeremy has stumbled across something here. Theoretically this set should have a different number to the Classique shaped Candy, but it doesn't, it has the same number !!!! Janice, As far as I know the Modello saucer is different from the mug saucer but I have no mug saucers here to compare. My Candy saucer is 157mm diameter. It's a big'un! The mug saucer and the cup saucer are the same size Jeremy. I had a look at the Modello saucer on Portage and see I was one mm out on the measurement. I was using a 150mm rule so had to estimate the remainder: it could actually match their 158 but it is certainly bigger than the one I thought was the mug saucer (4050) at 155. Please help me out by telling me the number for the mug saucer. Actually with a tape measure of a decent length the saucer came in at 159, halfway between the two sizes I saw for the 4071 which it says is the Modello saucer. It was the number for the mug saucer I wanted, Ev. When you have the time! what date did CL go to the 5 digit numbers? compared with modello series? 1980's sometime I reckon, though I haven't done any deep research, have you? I never found anywhere where is it was said... but the 1981 price list had the 5 digits..
BTW - Still working on that from your other post. ev wrote: 9 different Modello patterns ..
Only 7 sorry Darls, you have listed them all.